The Chicken Recipes Kitchen (The home of delicious chicken recipes) invites you to try Chicken confit with French beans & herb chicken jus recipe. 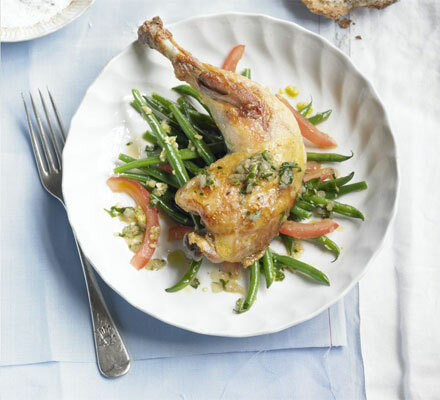 Enjoy our collection of quick & easy recipes and learn how to make Chicken confit with French beans & herb chicken jus. Lightly crush the salt, thyme, peppercorns and juniper berries with a pestle and mortar, then rub all over the chicken legs. Press half a bay leaf and a few garlic slices onto the flesh side of each leg. Put the chicken in a non-metallic container, cover with clingfilm and chill overnight. Heat the oven to 150C/fan 130C/gas 2. Rinse the chicken legs thoroughly and pat dry with kitchen paper. Pack tightly in a small deep roasting tin and cover completely with olive oil. Bring to a gentle simmer on the hob then cook in the oven for 2 hours. Cool, then cover and chill in the fridge. The chicken will keep for at least two weeks as long as it is completely submerged in the oil. Several hours before serving, remove the pan from the fridge to allow the fat to soften. heat the oven to 200C/fan 180C/gas 6, then lift the chicken out of the fat, put on a shallow roasting tray and cook for 15-20 minutes, until the meat is heated through and the skin crisp and golden. To make the jus, put the shallots and wine in a small saucepan and cook until most of the wine has evaporated. Add chicken stock and simmer until reduced by half. Season, then stir in the herbs just before serving. Boil the French beans in salted water for 3-4 minutes, until al dente. Drain then chill in iced water. When cool, drain again and set aside. Gently fry the chopped garlic in olive oil for one minute, then add the beans with a drop of water. Cover and steam until the beans are piping hot. Stir in the tomato strips. Spoon the beans onto plates, arrange the chicken legs on top then drizzle with jus. Serve with crusty bread. Recipe from olive magazine, August 2010.